I feel the need to start this post with a disclaimer. Any reader who is unable to take a joke, please stop reading. Just look away. Any reader who doesn’t understand that being a teacher means some bad days, please click over to this post. You’ll like it better. All others, read on. Don’t say you weren’t warned. This post contains a fun little pun. Really. It’s funny. No matter what job that you work, some days just plain bite. I know this for a fact. I’ve worked healthcare for a long time. Do I care about patients and people in general? Yes! Do I like working in healthcare? Yes! Are there some days when I clocked in for a shift at 8 a.m. and was ready to clock out at 8:01 a.m? Yes! I know that teachers must feel the same way. In spite of their desire to further our children’s education, there have got to be days that seem particularly tough. 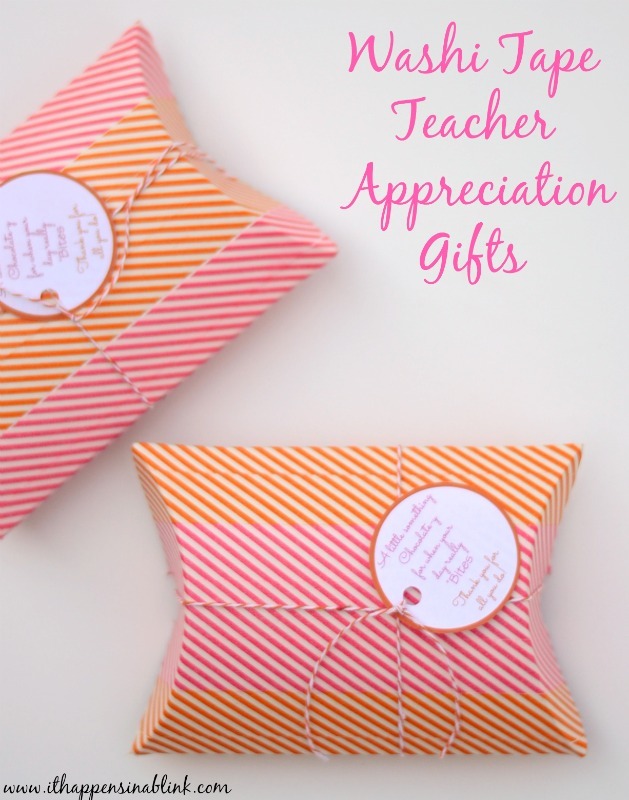 Today’s teacher appreciation gift is especially for those days. 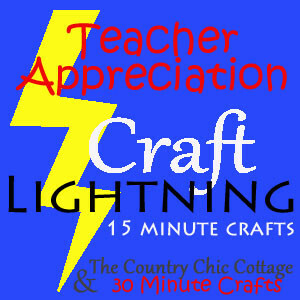 And as part of a special Craft Lightning Teacher Appreciation week, this project takes less than 15 minutes to complete! 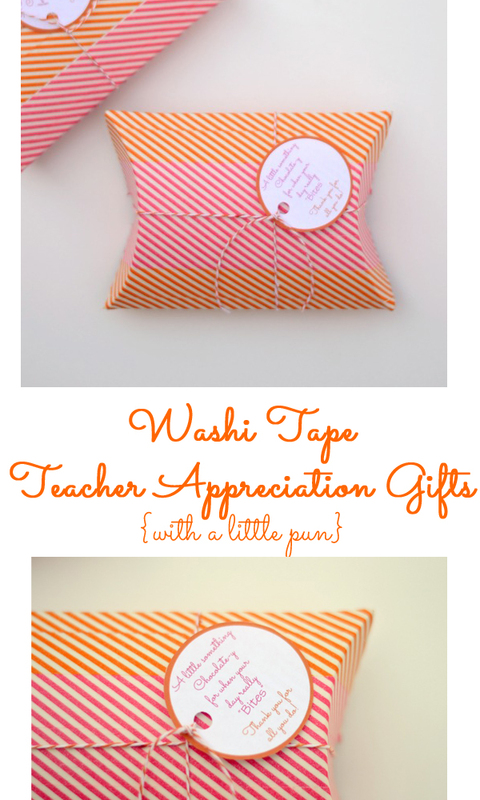 I even impressed how great this Washi Tape Pillow Box Teacher Appreciation Gift (with a little pun) turned out in 10 minutes! Plain pillow box- I ordered mine from Pick Your Plum when they were on sale. Grab a medium or large one for this project. MARS Bites- These come in several different varieties. I’ve enjoyed baking with them in the past, but today I’m leaving them in their bite sized portion. These Bites are the central point of the project, so be sure to grab them! 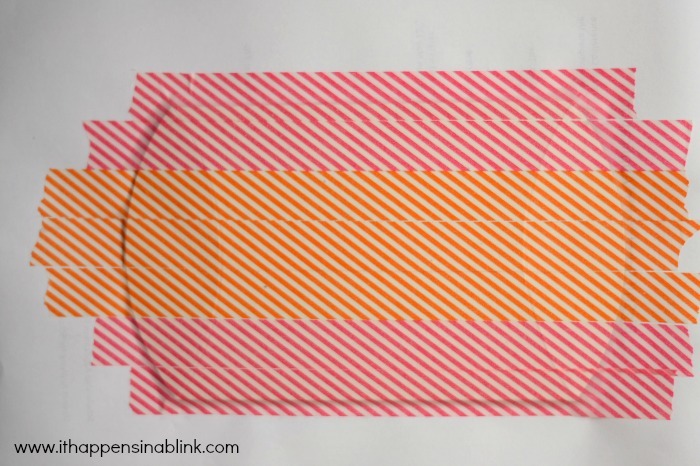 On a self healing mat, apply washi tape in strips vertically on the pillow box. 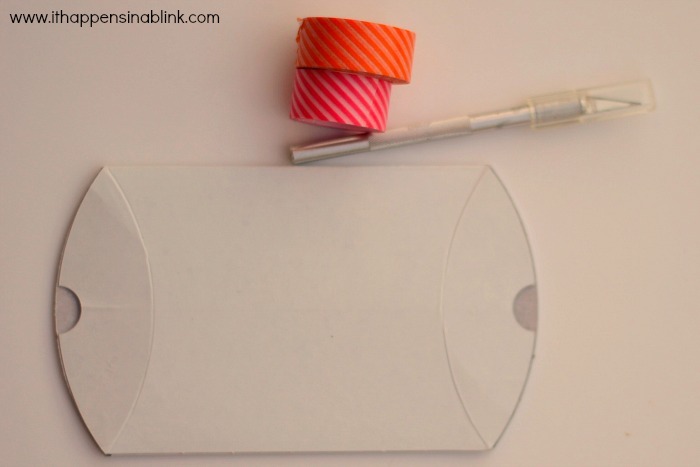 Use the craft knife to carefully trim the edges of the washi tape cleanly close to the pillow box edge. Repeat with opposite side. Close one end of the box and insert MARS Bites. If the box is large enough you can place the entire bag inside. 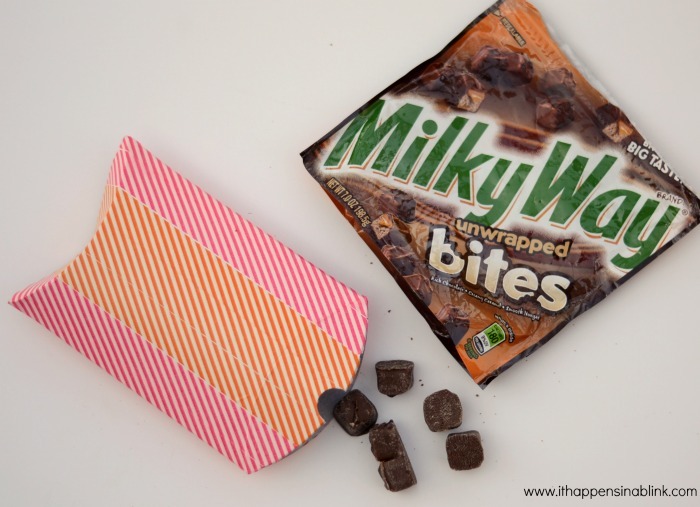 For medium sized boxes, wrap bites in parchment paper or plastic wrap and place them inside. Close the other end of the box. Wrap baker’s twin around box and attach printable tag. HA! Everyone has days that “bite”! And chocolate is especially called for on those days. I TOTALLY love this idea, and the packaging looks so pretty! Super cute, I am sure my son’s teacher would get a chuckle out of this! Very cute idea! And yes teachers have these days. By mid-May this just might have been everyday. Such an adorable idea. I just volunteered in my daughter’s class this morning and I don’t know how teachers do it. They are super-human! I know! Teachers are special people! Love this! These are so cute! Love the saying! And those pillow boxes are gorgeous!! Love this! Any project with washi tape is right up my ally. Such an easy way to put some pizazz into a plain box. Thanks for sharing! 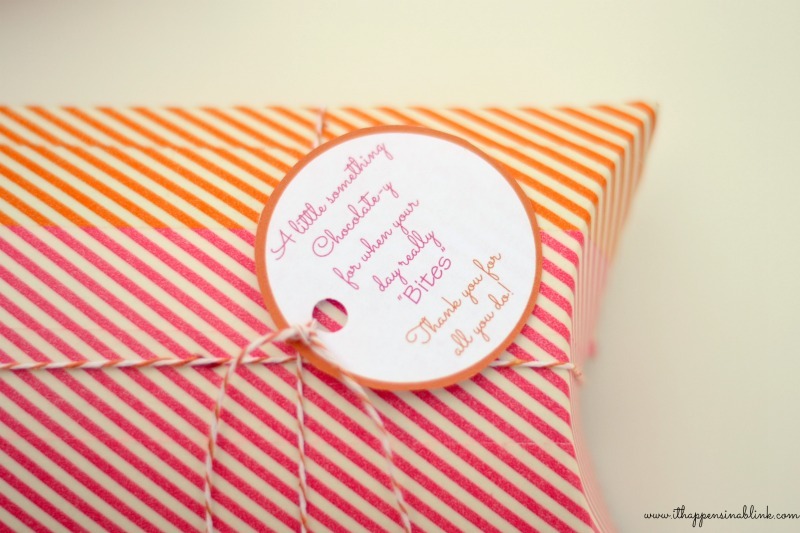 This is such a fun project…..I think all the teachers will be wanting your gift! These are adorable! Great use for washi tape too. The stripes and the ombre go so well together! I love this–and as a former teacher, I know that some days really can bite! Haha! I bet! Thanks, Sky! Love how it all came together. So cute!!! I love the washi tape! And the little poem!